The Blue River spreads and divides to make Spruce Island just before pouring into the Maggie Pond at the base of Peak 9 at the Breckenridge Ski Resort, and on its bank, opposite the island, are Tannenbaum Condominiums by the River Condos. 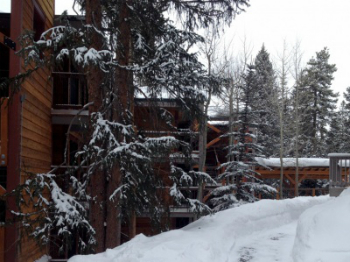 Located on Columbine Road, any Tannenbaum condo for sale will offer easy access to Peak 9, via a private ski or hiking trail through the forest. Columbine Road was reconfigured in 2000, and currently is a quiet residential loop that serves several condo complexes. Tannebaum condominiums are tucked into an old growth stand of Spruce trees facing the river, and has always been all about solitude and privacy. Check out the Tannenbaum condominum listings below to find that perfect home, or read more about this subdivision. Tannenbaum properties consists of two connected board-and-batten style buildings constructed in the 1970s. The one on the river was built to fit the river, and many of the balconies overlook the water. The second fronts on the road, with a motel-like façade, but each unit has a much better view and big windows to the back. An elevated walkway connects the two, so that both have access to the water, and the underground parking accessed from Columbine Road. Tannenbaum properties are in small complex with no homeowners association, but Spring 2012 brings an exterior remodel. A ski trail leads over the river and to the lifts, while other walking trails lead to the shops in Breckenridge and further into the national forest. The Burro Trailhead is a few hundred yards up the ski slope. The free town bus stops nearby, as well. Fishing is good in the Blue by Tannenbaum condos with wild Brook trout augmented by a small stocking program upriver by the town of Blue River. The Columbine community pool is across the street and all the Tannenbaum condos on this loop are welcomed members. Size (SFLA): 1212 sq. ft. to 1497 sq. ft. 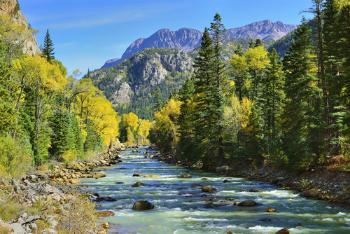 Amenities: Fishable stretch of the Blue River out the door, Peak 9 and Quicksilver Lift a short ski or walk down a forested trail, trees, privacy, small complex, in-town. Located across the Blue River from the base of Peak 9. Drive south on Main Street to last stoplight at Boreas Pass Road, turn right on Broken Lance Drive. Turn left to remain on Broken Lance, turn right onto Columbine Road. Tannebaum by the River is third building on the left. Contact us today to talk to a real estate professional from the Breckenridge Associates team. We can help you find that perfect real estate opportunity in Summit County.